What color is the sky in the world that you live in? 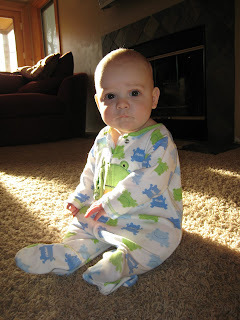 it took about 2 months to get my blog back! 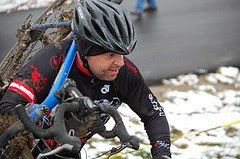 The first mountain bike race is in the book (Syllamo's does not count) and it was a great one! I highly recommend peeps put this as a must do race next year. Columbia is a short drive for KC area, St Louis and even the Iowa folks showed some color today. Rain lightly hit the trails early in the morning so the first racers got a little muddy and the trails were slick. I did a test lap and found most of the trail was fairly dry, but the parts that weren't were brutally slick. The start was very fast, down hill and into a muddy corner. Most of the expert field seemed to navigate it fairly well, but i heard some other fields bit the dust or mud we will say. I got an average start, the expert field was fast off the line. One clown jumped the start and got the hole shot, but missed a turn. His yin and yang were not in balance! The field strung out fairly quickly and I was about 7th out of 15ish when we finally found our grove. Unfortunately, my grove was much slower then the rest and i pushed myself into anaerobic. Luckily i soon wrecked and found myself in my own pace, but feeling like poop. The next 10-30 minutes i was trying to recover and never really did. After that I showed some signs of life and road like I could compete with these guys. 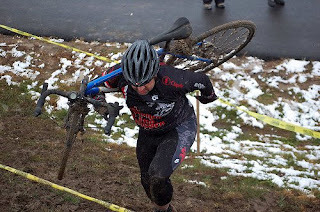 the other times I was just a guy on a bike trying to finish with some sort of dignity. The course is great, nice combination of SM Parks speed and flow with a little bit of open road/field for recovery or passing. The tempo would have been nice with a little more experience there. After the first two laps I was familiar enough with the climbs, descents and traverses that I could hammer it up or through the turns. At the end I finished 3 laps in 88 minutes, enough time to do another lap had i not been a sissy. Just did not feel like it. Glad i did not, 6 hours later I still feel like poop. A short soak in the hot tub to stretch the muscles, some really bad food, one Guinness (yep one) and i am pert near ready for bed! Ps Syllamos did not count as a race due to the poor production and condition of the course. One hour in to the ride I knew I was there to survive. Did finish 67th out of 260ish? New Years eve featured a scallop dinner with friends and some dominoes! Had two races to start the year, finished 4th in one and 7th in the other and 3rd place for the series. About two weeks in to the year rates dropped to an all time low and work flowed in. It was so fast I was forced to clean my office and start a new approach for doing appraisal work. they can help you track the calories you are eating. I used it for about 3-4 weeks starting late December with no results, but hey its December what can you expect? My goal was to get down to 200, but now that is only a few pounds away and I still have a nice beer belly left. I ended up losing 11 pounds in 8 weeks by counting calories and exercising. Luckily there was never a need to give up BEER Not sure where the bottom will be, but I will continue to exercise and eat a reasonable portion with modest amounts of cheating. The Babe got a promotion and is now the office manager. Taylor is crawling and cut two teeth, Reece is about ready for potty training (no arguments on what "about ready" really means!). Reece also started swim lessons, so far so good. I have had 4 epic mountain bike rides with fellow team mates and friends. 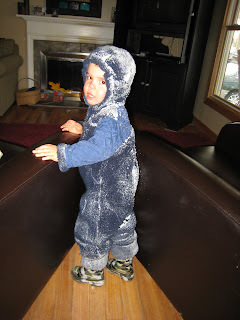 The winter season did not offer up any night rides, but got 3-5 good snow rides in. So far 2009 has shown some promise in the appraisal biz and maybe finish the house? Not sure what it is about mud that brings out a playful and curious aspect of our personalities? Generally speaking when its below freezing, 20 mile an hour winds, some snow and wet sloppy ground we tend to stay indoors and mind our beer and TV. 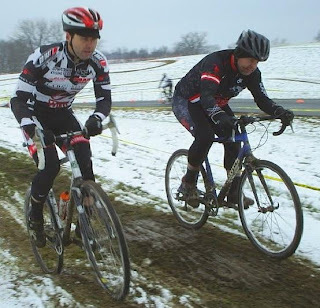 However, cyclocross is not your normal sport or crappy weather activity. 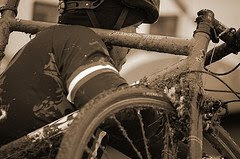 There is nothing normal about riding bikes around a mud filled course in weather like this. 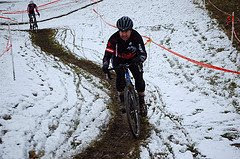 The course was set up to challenge the riders even in dry conditions with lots of climbs, off camber turns and run ups. When the weather turned bad and got worse it turned the course into a mud fest filled with slippery run ups, slick corners and wheel stopping MUD! 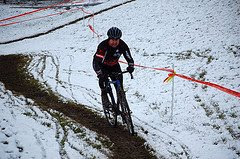 I believe every rider was having problems, shifting, braking and clipping into pedals plus the cold wind and mud was enough to challenge the mind let alone the body. 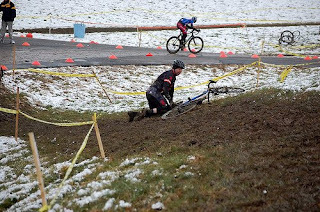 Chris lead the way around a corner on his single speed "Ouch"! After a spotty start on asphalt the course dropped on to a slight incline that I was able to ride about an hour before the race, but 40 plus riders doing 3 laps took its toll and left all but a few running their bikes up the hill. At the top it turned back down, over the road, through a off camber dip, around a sweeping off camber turn, through double barriers (i did not fall this time) and back up the hill. This section was manageable on the bike for most riders and lead to a longer downhill that swept around and into a series of "Up & Downs" that would have been difficult on a dry day. On Sunday, not so much! The tricky dismount followed buy a slick run up, followed by a slick decent and yet another run up sent me into anaerobic meltdown. Having gained the "Summit" and in position to mount the bike again we get our first taste of "clogged cleat melt down". Time Atac being a popular pedal for its quick entry and exit proved to be the proverbial scapegoat on this day. 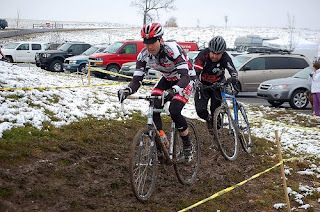 Trying to pedal and clip in with cleats pack full of mud and ice while fighting for breath was almost a game changer for me. Thankfully I realized that most people were having the same problems and managed to fight their way through it. Once clipped in we were challenged by another sweeping off camber turn that whipped us back around towards the worst run up of the day. 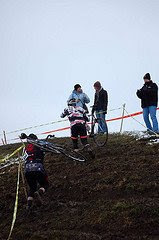 A planned dismount that had steps cut into it reeked havoc on the racers. It went up and to the left and sent the very best riders sliding back down on their buts. Not only was getting up a challenge, going down was a bumpy, muddy mess. Trying to mount the bike at the top and riding down was a bad idea, running down did not bode so well either, walking with your bike using it as a cane turned out to be the most productive way to navigate the challenge. 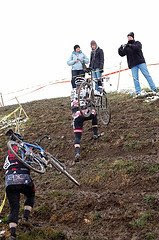 The rest of the course was more off camber corners that frustrated and bewildered the riders. Five laps later I crossed the finish line after 45 minutes of pain. Fortunately, I was lapped and my race ended a little early. Finishing 20th out of 23 was not quite what I expected, but then again what else could I have done. My weight is my issue, period. Racing 15-20 pounds lighter would not guarantee a win, but maybe I could be more competitive. 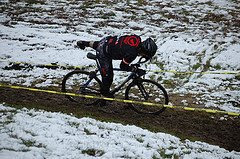 Even with some of the best wheel sets and bikes taking the course head on, our technology proved to be no match for mother nature . This was a nice little wake up call for the US National Championship December 11-14th and should give us time to modify or prepare for what mother nature will throw at us. 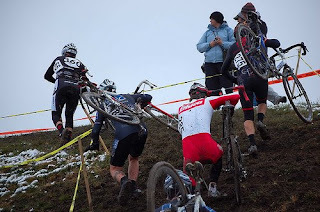 Cyclocross proving once again that its one of the toughest racing events around! 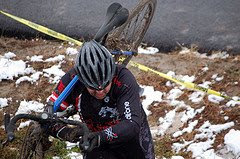 Weaving through the "Spin Zone"
Last Sunday was the Kansas Cyclocross Championship at St. Marys University in Leavenworth KS. 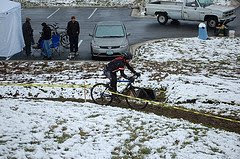 The course was laid out great, with a nice mix of cobblestone, dirt run ups, sweeping down hills, a "Twister Turn" that spiraled in then out and of course barriers. The start (Click on start for the youtube video I am in black left side of screen) lead us up a slight incline over ancient cobblestones laid in a weave pattern that shook the bike and impeded rolling. 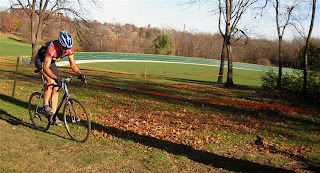 After the whistle blew I quickly accelerated and moved into second going into the grass. The first turn I cut inside the leader, got out of the saddle and powered to the front. After a sharp, off camber corner, the course lead up slightly then down hill. Midway through the descent I met my demise; the first set of barriers. Rounding the corner heading into the barriers I was supposed to slow down and prepare for the dismount. Unfortunately, I did not feather the brakes enough and tried to dismount while going faster then I could run. 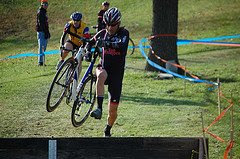 My left foot clipped the barrier sending my bike into the air and me into a superman flight pattern. The lead was "gone with my wind"; staggering I mounted the bike and lost a few spots. Joe in the "Twister Turn"
Once on the Cobblestone road coming back up the hill I blew up. Everyone was passing me, Larry Smith streaked by me, Todd and a few other people I wanted to beat. The next few laps were miserable, don't even remember parts of them. 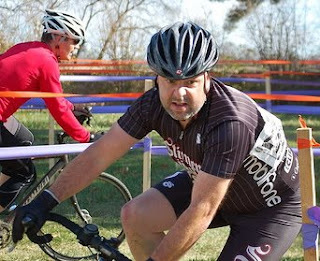 After the third lap I started to real in a few riders including my neighbor Todd. 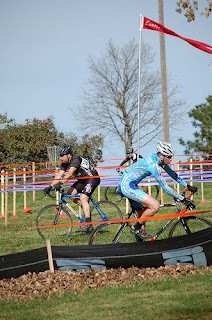 With two laps to go I was seven seconds behind and needed to make a move. 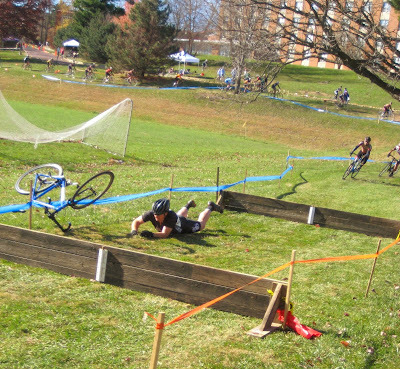 My traditional strengths of rolling downhill was not working for me. The turns were not technical enough to challenge riders; giving everyone a free pass down the hill. I had to attack on the cobblestone coming back up the hill. 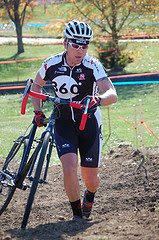 Each time I got out of the saddle and powered up the hill, closing the gap slightly on each lap. I caught Todd and a few others near the end of the fifth lap. When I heard the bell lap I drew some more energy and tried to put distance between me and the other riders. 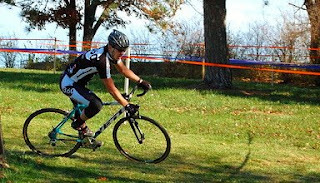 On the last lap I caught a few more people, rounded the last corner and sprinted to the finish taking a disappointing 17th place. 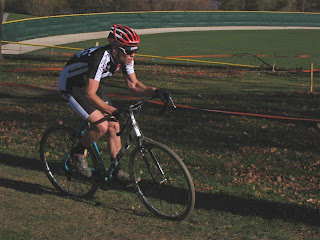 Not the most exciting finish or best race I have had, but I am making improvements. The key to this year and beyond is learning my limits, how to prepare and how to recover. 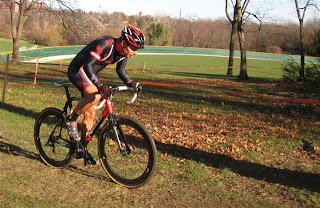 Swope Park Trails are Here! 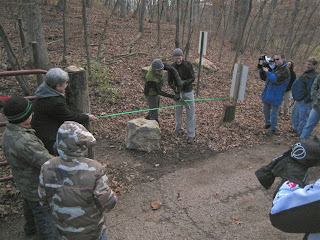 The ceremonial ribbon cutting or the new Swope Park Trail system was today. 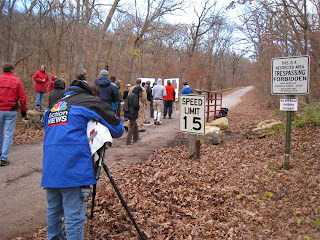 A surprising turnout of 30ish people in 30 degree weather for a much anticipated 1.3 miles of starter trail. 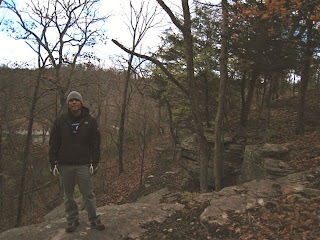 I had a great deal of skepticism when they announced the planned trails at Swope Park. Years ago I played soccer there and the problems that occurred with fights and people breaking in to cars left me with a pretty sour taste for Swope Park. Fortunately I was wrong again, the trails are located further South and East of the recreational fields and offer parking along a busy road. 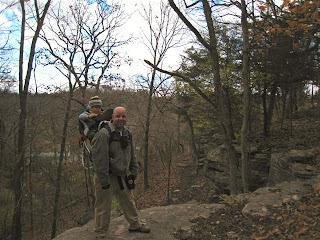 The area seems to be far enough from the "Riff Raff" that it will provide a fun and safe place for riding and hiking. The trails and terrain will offer some of the most diverse riding in the area, rivaling our flag ship trail system at Landol Park. 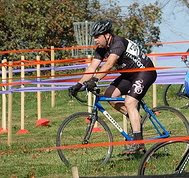 With long sections of elevation gain, rocks, cliffs and sweeping turns Swope Park has the potential to be the Midwest's leading cycling area. Future projects include a trail system that would link the Minor Park System and potentially have 60 miles of trail within the city limits! Imagine the first intercity 60 bike race? An out and back loop that would take the riders down Blue river, through the second largest intercity park in the US and out to Minor Park. The cycling future is bright in KC!